Here are a couple of bears I’ve been working on this week. Debbie sent me all that great Comes Mart stuff and I wanted to send her a softie in return. 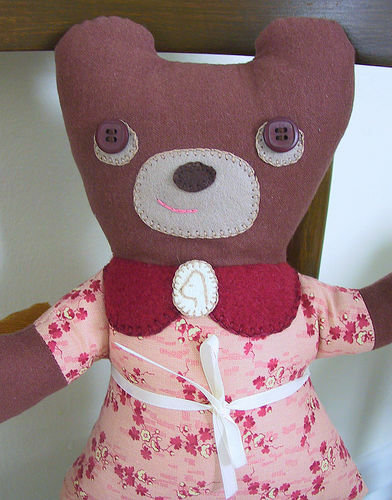 I asked her bunny, kitty or bear and she chose bear and so I tweaked the bunny doll pattern to make a bear doll. 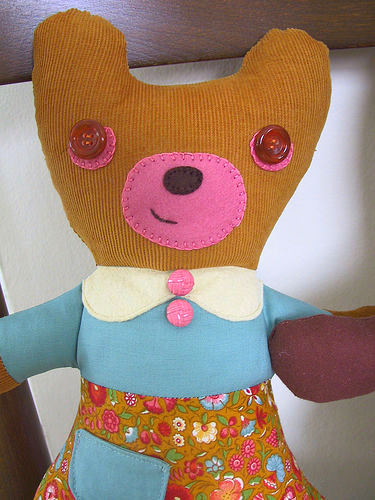 Shorter ears, shorter legs, big nose… they turned out sufficiently bear-like I think. My Mom got in on the action and asked for one for her friend’s new granddaughter so there are two. 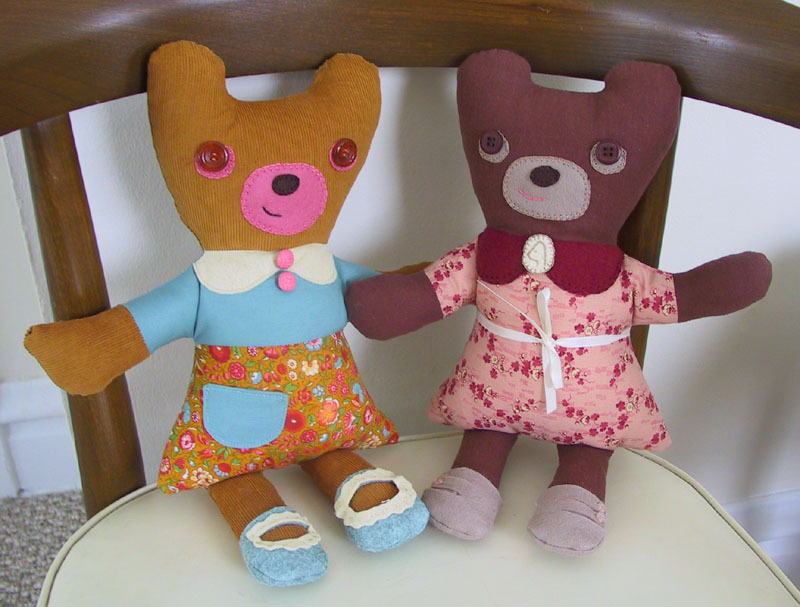 Cordelia, on the left, is made of corduroy and is for Debbie and Cora, on the right, is brown flannel for baby Alicia. Cordelia has a wool felt collar and cute pink vintage button (thanks Melissa!). I experimented with making the one-piece dress actually a two piece top and skirt. I’m excited with how it turned out. And she has a little pocket for whatnot. Cordelia’s shoes. I’m pretty happy with them but what I really want to get is a teeny tiny hole punch so I can punch out little designs in felt. Maybe something like that is a scrapbooking gadget? Cora’s sporting a little wool felt cameo pin that I tried to embroider a bear profile on. heh heh. Stephanie the answer to your question is because I’m a wacko. She had a big wide spot in the center of her collar to fill and the dress fabric seemed sort of victorian to me and a cameo popped into my head. It’s a pretty wonky cameo and surely this baby will chew it off in a new york minute but it was fun to make. Cora’s little wool felt victorian button ups that actually button up. Ok, Oscar’s up from his marathon nap. Off to the baby pool! I’m thrilled with Cora! Can’t wait to see the lucky little girl’s face. 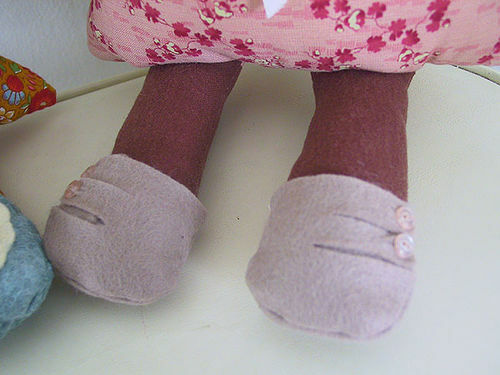 I love their little smiles and there little shoes. wow! I bet you’ll make many of these – they’re beautiful! And the shoes keep getting better and better! The cameo and button-up shoes are brilliant. Makes me want to take a break from the mid-century aesthetic and do some Victorian-themed stuff. Why, oh why, is my sewing machine broken? All the details are so perfect and cute! I have a punch for you! It’s a 1/16″ circle punch from Fiskars. Email me w/ your address and I’ll pop it in the mail! I am trying to make a shirt with the fabric you used for Cordelia’s skirt! It looks so good with baby blue and as a skirt, though, that I’m about ready to see if I can rescue the fabric for a skirt. I am having trouble with overcasting a raw edge. grr. But your bears are super cute! 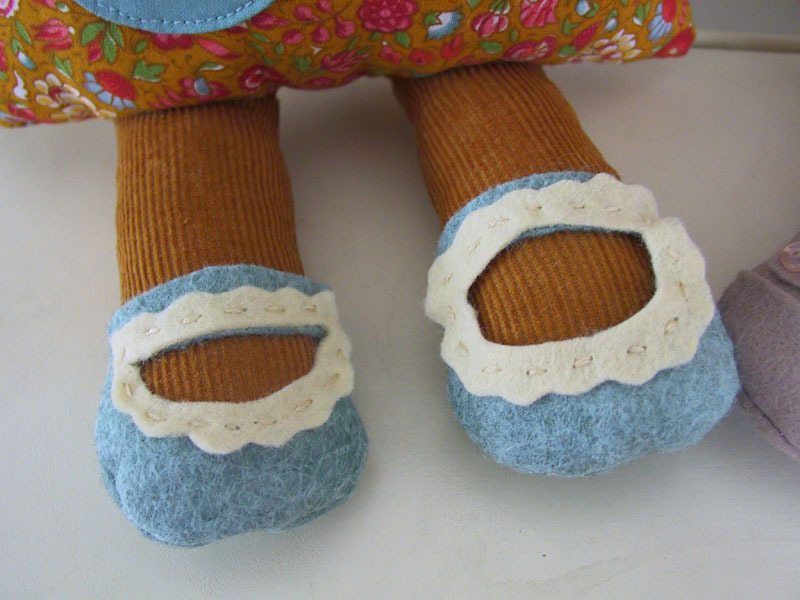 Love the button eyes & blanket stitch details. i love them both. all the details, the pink rimmed eyes!!!! the button up shoes, the collars, the two-piece dresses. you are so industrious it amazes me. when my friends say, oh robin, she’s always making SOMETHING, i think of you and bow my head….! adorable, love the corduroy body and cute cute bodies. very cute! your work is always lovely. for tiny holes, an awl might work too — and you can use it for sewing and book/paper crafting. clover makes a couple that i hear are pretty good. The bear cameo is the most darling thing in the world! very nice! I love the what-not pocket and the cameo is brillant. really, really, really good. Wow! This is some of your best stuff yet, I think. I wasn’t so sure about the bunnies, but you’ve won me over with these bears! hillary, these are *THE* bears! it’s easy to see your talent and your patience and dedication. congrats! HI there! Do you trade your dollies with other people’s? Id like to get one of yours and if you like any of my dolls maybe we could trade? love the shoes. im mad about little shoes hihi. love the shoes. im mad about little shoes hihi. awww… love the kitty. Both are very cute – adorable really. Love their shoes and dresses, you are so good with details! Wow, they are both fantastic!!! You should use a hole punch for rivets, I have one for my scrapbooking but I know they make some for fabric that work the same way. They come with multiple heads so you can do varying hole sizes and you just use a hammer with them. I think a regular hole punch wouldn’t work on fabric. Thank you for all…..lovely …..